Drew Smiley and Kevin Butler congratulate Josh Freilich on his first goal. Freilich would record a hat trick for the Pioneers. Just an FYI for those of you new to the blog, these are just my wandering thoughts from a few parts of the game. If you would like the full recap, head on over to BostonLax.Net, and if you would like to read a side bar about St. John's already playing playoff lacrosse, you can check that out on ESPN Boston. Now, onto St. John's locking up the No. 1 seed in the district playoffs. One thing we learned Monday was that St. John's will be tough to beat if there is a playoff heat wave. They just have so many athletes, and they keep coming at you in waves that opponents can't help but wear down in the second half. Between Drew Smiley, Hunter Burdick and Josh Freilich on attack, there is so much firepower, but you better not sleep on sophomore Parker Jean either. Add to that depth the fact that the Pioneers have found a bit of offensive balance between the attack and middies, and you have a heck of a conundrum when you're trying to defend St. John's. Do you collapse on those three explosive attackmen and allow Kevin Butler, Connor Long and Patrick Ryan room to work? Or, do you play them straight up and hope you can keep Smiley and Burdick in front of you, while also denying Freilich's long shots? It's certainly not going to be easy for anybody in CMass to slow these guys down. The Pioneers went all "Chicago Bulls vs LeBron James" on Indian All American Bryan Rotatori, getting physical with the versatile middie and never allowing him to get comfortable. I don't think Rotatori had a possession all game where there weren't two Pioneers relentlessly smacking him, and there were a few fouls that St. John's committed against him that went uncalled. Rotatori was clearly not pleased, and his frustration showed. It was a great strategy by St. John's, as it took Grafton's best creator and a fantastic scorer off his game. Remember when the Bulls did that to LeBron to end the Heat's 27-game winning streak earlier this year? Pretty similar effect. For sheer entertainment value, I would love to see these two teams match up again, if for nothing else than to see what Rotatori has in store for the Pioneers. He's one of the toughest and craftiest players in the state, so the odds of St. John's getting the best of him like that twice are pretty low. Not actually sure if that's true, but it is at least 3/4ths of a lacrosse game. I feel like I say this every week, but you just can't win if you only have the ball half the time your opponent does. 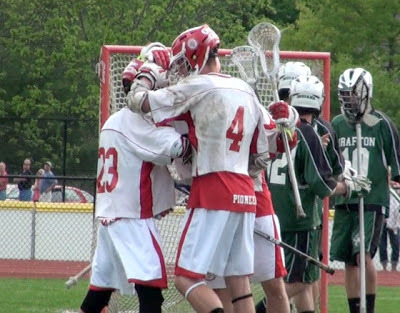 St. John's was on the wrong end of this last week against Longmeadow, but Connor Maloney was fantastic on the draw for the Pioneers Monday, especially in the second half. Making matters worse for Grafton, was an uncharacteristic lack of ground balls. So much of what the Indians do revolves around winning the ball and getting the break going on long passes from goalie Eric Fisher to either Reilly or Rotatori. The Pioneers, specifically defenseman Aidan Fox, did a great job of winning those ground balls and limiting the long pass opportunities.